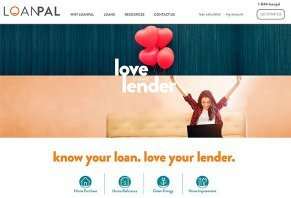 Loanpal Reviews - Best Loans For Your Home? Loanpal is a lending website that provides four loans for homeowners: home purchase, home refinance, solar and home improvement home equity lines-of-credit. The company behind Loanpal is Paramount Equity Mortgage; they’re the ones who fund the loan you apply for on Loanpal. Paramount is based in Roseville, CA, and, according to the site, they’ve funded more than $25 billion in the past 15 years. Loanpal’s founders are Hayes Barnard (current chairman), Matt Dawson (COO) and Jason Walker (CRO). Barnard’s resume is impressive; it includes positions at Oracle and SolarCity. He also started two companies, Paramount Solar and Paramount Equity Insurance, that he eventually sold. Based on our research of the minds behind Loanpal, we believe there’s enough expertise there to lend credibility to the company. However, choosing the right lender to fund your mortgage, refinance, solar or home improvement purchase is more than just finding the company with the best founders. It’s about understanding what the various loans offer, knowing what the company’s guarantees and fine print say and finding out what other consumers are saying about their experiences. In our review, we’ll cover each of those areas through in-depth research. A mortgage is a loan that a lender gives you to buy a home. You “own” the home but the lender has the title, which is a legal document that says the house is technically theirs until you pay off your mortgage. So, if for some reason you stop making payments, the lender can foreclose on your home – they can take it – because they’ve got the title. Mortgage applications are very in-depth and will most likely be the most intrusive financial decision you’ll ever make. Thankfully, sites like Loanpal make the initial steps of your application simple via their online process. According to their site, it takes all of three minutes to get the information they need to give you a rough estimate of how much you can borrow and at which rates. When you head to Loanpal, you’ll need to realize that they’ve got several options for mortgages and refinancing. As a borrower, it’s important for you to know the differences. These are the various types of loans that you could be eligible for but you won’t know which one you’ll get until you get a loan estimate from Loanpal, who will determine the best loan for your particular situation. Keep in mind that you’ll also be eligible for various types of interest rates. The two main categories are fixed-rate and variable-rate. Fixed-rate loans have one interest rate you’ll pay over the life of the loan. Based on your own particular financial situation and Loanpal’s application process, you could get a loan ranging from 10 to 30 years. Variable rate loans, on the other hand, start out with a fixed rate but after a certain number of years switch to a rate that rises and falls with the “prime” rate. Your Loanpal interest rate, according to the fine print, will be whatever the prime rate is plus 2.75%. Refinancing is a tool that many consumers use to lower their monthly payments by renegotiating the remaining balance on their mortgage to take place over a certain amount of time at an interest rate that’s usually lower than what they’re currently paying. This option is something that’s popular when mortgage rates go down and are lower than the rates borrowers received when they first obtained their mortgage. Loanpal works with solar companies to provide funding for homeowners who want to install solar panels on their homes. To get connected with a solar installer, you fill out a quick information form through the Loanpal website. Solar companies they partner with will contact you then work with you to come up a quote for what you need. Once you’ve decided which company you’ll use and accept the quote, Loanpal funds the loan. According to their website, loans go up to $100,000 and, in some cases, don’t require a down payment. These loans are what’s known as home equity line-of-credit loans, or “HELOC’s”. These loans are typically given to people whose remaining mortgage balance is 80% or less of their home’s value. Basically, if you’re eligible for a Loanpal HELOC, you’ll be approved for line-of-credit, which works like a credit card. You can use some or all of the loan’s limit during what’s known as the draw period. Once you withdraw money, you’ll be responsible for monthly payments on the amount you borrowed. In most cases, these payments will be lower during your draw period because, in many cases, you’re only paying interest. Once the draw period ends, you’ll enter repayment and your monthly payments will include principal and interest, which is usually much higher than interest-only payments. For consumers who meet Loanpal’s requirements for a HELOC, the money can be put toward home improvements that will, in theory, further increase the value of your home. We read through the fine print and found that there are some exceptions to these guarantees. First, you only get the better-rate guarantee if you can show a loan estimate from the competing company for the same loan product given on the same day. This one can be tricky because different loan officers may use different types of mortgages to get you approved. And, if the type of mortgage they get you is different than what Loanplus offers, it won’t count. The majority of LoanPal’s consumer reviews can be found on Zillow, LendingTree and the company’s Better Business Bureau page. These three sites are important because they give you the perspective of people who’ve dealt with the company in three different ways: through a loan aggregate site (LendingTree), a home buy/sell site and a business ratings site. Across all three of these platforms, the business fares well with its customers. The average ratings are excellent. Many customers were grateful for the way that Loanpal worked on their behalf to get a loan and there were several recent comments that complimented the friendliness and professionalism of their loan officer. Negative reviews focused on repeated requests for the same paperwork, and rates and terms that changed over the course of the loan application. The positive and negative reviews we read were similar to what you’d find for most lenders. Based on our research, we believe than Loanpal offers homeowners and future homeowners a seamless way to apply for a mortgage. They don’t contain much information on their website, which can be a relief for those who are easily overwhelmed by complex language about mortgages. However, in our opinion, that simplicity is also the site’s greatest weakness. Because a mortgage or a refinance is such a huge investment, it’s really important to understand what type of loan you’re getting, which loans may be the best fit for you and which ones won’t work. So, our advice is that, when you get a loan estimate from Loanpal, take an hour or two to read over it and to research the type of loan you’re getting. At the same time, you’ll want to get loan estimates from one or two other lenders so that you can compare what you’re being offered. Note any differences as to the type of loan the lender is giving you as well as the difference in the various fees that you’ll be charged. In our opinion, Loanpal is a great site for someone who either is really familiar with mortgages and refinancing and doesn’t need a lot of information, or for the person who is willing to put in the time to thoroughly understand the type of loan Loanpal is offering them. I was first contacted by phone by a Loanpal agent. This was April, and I was told they could save me money on my home payment. After sending many docs and verifying income and others, they sent me e-signature docs on my laptop. Great follow up at first, but then no return calls. The first agent no longer works there, others I worked with were out on medical leave, no agent had our old info and I started over many times. Then they said ok, if the appraisal is good you have a loan. Wrong. It was $140.000 more than the current loan and there is still no loan. Then they said Fannie Mae doesn't like my home. I called them but they said I can't talk to them but the loan company can, and if they requested a reconsider on loan after giving them the info. I told them they would most likely give loan. They did not make a request. Now I have no loan five months later and am out the appraisal fee, which they said they will not refund. Not a good company. They could give me a loan on their own without Fannie Mae. It's under $300,000. Credit hit, $200 gone, and when asking about the decision, David hung up the phone! I should have known better. Did, in fact. He called, talked fast, sent all of the paperwork, had the house assessed, "you're approved." Credit attacked, promises made, and when I called to see what the problem was, got hung up on. What makes it so egregious is that I told him up front I would not qualify and then fell for the okey-doke. I don't claim to be a victim, but those of us who are just trying to do better need to hang up the phone on the Davids who snow you over. I would not recommend Loanpal to my worst enemy, let alone any level of friend. We just refinanced with Loanpal, were told they don't sell your mortgage, but THEY DO! Our mortgage was sold to Wells Fargo, the worst financial institute ever. Apparently, these two go hand and hand. Sneaky, unethical, and dishonest! During the last year, I wanted to refinance our mortgage. Accordingly, I contacted several lenders who were reported and recognized as leading lenders in America. The lenders, on my initial contact, were very eager and friendly to gain my business. However, after time was spent gathering needed information, every lender I contacted eventually told me, based on my historical information and Texas law, that they could not do the refinance. They told me I should wait several more years, contact them again and they would be glad to reconsider. On March 5, 2018, I received a call from Kenny Nguyen, who is with Loanpal. The call was regarding my earlier efforts to refinance our mortgage. What became obvious to me about Kenny, not only was he very friendly, but he listened intently to my situation, both past and present. And perhaps more important to me, he did not scare of the situation, did not say no and did not go away. The law in Texas that all the other lenders told me was preventing me from refinancing my mortgage, Kenny knew about this law, but he was also more current on the law and knew it had been changed January 1, 2018, allowing me to refinance. I also appreciated that Kenny would answer every question I asked and very promptly. I did not have to leave a message and wait days for a reply and answer. As the refinance process picked up, I communicated with other Loanpal staff who were just as friendly, prompt, and answered every question I had. We were approved and closed on our new loan thirty-three days after receiving our first call from Kenny Nguyen. We highly recommend Kenny Nguyen and Loanpal to anyone considering mortgage financing of any kind. I am really happy with my experience with Loanpal. My loan officer was really knowledgeable and helped me pay off my bills and get a lower payment. It took a little longer to get the loan than I wanted, but that was ok. I will definitely recommend Loanpal to my friends. Working with Patrick was great. Not only did we purchase our house with him and he was great, he was on top of it the whole time. At no point did I feel like anything would slip through the cracks. Very communicative and I always got ahold of him any time I needed. We even refinanced with him to get a better rate down the road since rates had dropped again. A great experience. Great experience working with Pat! I am very satisfied with my refinance through Loan Pal. My loan officer, Patrick Jones, was very efficient. Very friendly and knowledgeable. I was able to take out a lot more than I previously had anticipated. Overall very pleased. I will defiantly recommend friends to Patrick. I loved working with the staff (Patrick Jones loan officer) at Paramount Equity. He was smart, knowledgeable, and efficient through the whole process of my refinance. And he was great to talk to. Refinancing your home entails a lot, and you want someone who can get you what you need in a calm professional way. I can’t say enough how it was great working with him. We did a 15-year loan with Loan Pal. The loan officer and processor were amazing. They exceed our expectations. From start to finish our loan took less than 30 days. All of our concerns were promptly answered. I have referred friends and family to refinance with them as well. The loan officer that was helping us was very thorough. Also, it felt to me like he really cared about what was best for my family. Loan Pal aka Paramount Equity Mortgage (PEM) is a risk you should not take. You will be wasting a lot of time, money, and causing yourself undue stress. I contacted PEM for a refinance. I spoke to Missy F aka Melissa Megan F. I was given an excellent loan scenario followed by a Loan Estimate (LE). I specifically asked several times, "How solid are these numbers?" or something very similar. I was told, verbatim, "This loan should only get better, based on the value of your house." Let's be very clear here, I was excited about the loan, and I wanted to make sure that there would be no surprises down the road. Missy supposedly "locked" the rates that day, which should have made the values of the LE fairly stable. I understand that prices can fluctuate a few $100 based on services, but this is not what happened. You can imagine my surprise when I ended up with a loan that was worse than Missy's pie-in-the-sky LE after my house appraised for a higher than expected value. Over the course of two months, yes TWO months, after I was told that the refinance could be done within three to four weeks, I received no less than four different LEs, all with wildly fluctuating numbers. In every instance, when a document was requested, I usually got it to them within 24-48 hours. I practically had to beg, call every day, email constantly and even had to show up to their offices just to get some answers about what was going on with the loan. They had numbers on their LEs that apparently they were not even sure how they got there. How is this possible? Loan Pal aka PEM was so inefficient in their execution of this loan, they blew a rate lock, which of course I ended up having to pay for. They also promised to pay for the appraisal, which ended up in the fees, which means that I paid for it. Let's list the lies that I was fed, followed by the actual outcome. Lie #1: You are getting a 0% of Loan Origination Charge with a total closing cost of $2,564. Reality #1: After multiple wildly varying LEs, I ended up with a 0.625% Loan Origination Charge with a total closing cost of $4,358.03. Lie #2: We can have this loan completed within a month. Reality #2: It took over two months. We had to pay for a rate lock extension because they blew it. Lie #3: I locked your rate today. Reality #3: My rate was not locked on the day indicated by Missy/Melissa. I have, as of yet, to get a clear answer on when that supposedly happened. Lie #3: We will pay for your appraisal. Reality #3: I ended up paying for the appraisal. Lie #4: You can make bi-weekly payments. Reality #4: Closing documents state that partial payments are not accepted. Lie #5: Your loan will only get better and the numbers presented in this LE will only get better. Reality #5: My house appraised for more than expected and my loan got worse on virtually every measurable metric. Please do yourself a favor. If you plan on gambling by allowing PEM/Loan Pal to provide you with lending services, do yourself a favor, hedge your bets. This means, go through this process with multiple lenders at the same time. The PEM/Loan Pal offer may be the best one, but they will not follow through. They will not be timely. They will not honor their word. When they start to mess around and miss deadlines or start to change their LEs, you can drop them and continue on with a reputable company. I timed my refinance at a good time to get a great rate offer from multiple companies. PEM/Loan Pal had the best offer at the time, and because they were so slow, I ended up having to make a decision on the other mortgage company offers. After getting multiple reassurances along the lines of, "Don't worry about the numbers, we will fix them at the end. We will take care of you," I decided to go with PEM/Loan Pal. This was a mistake, and it ended up costing me in opportunity and real money costs. PEM/Loan Pal will lie to you. They will offer you great loan terms only to change them at the end. Don't fall for it. Most homeowners do not understand how the loan process works, which is understandable. Being a former employee, I can correct you on a few items, interest rates are locked for 45 days. So, if your loan took over 45 days and you paid for a lock extension, then she had locked your loan. You also fail to mention your credit rating. In most cases, when a loan is held up it could be a result of your credit and or liens on the title. I spent two months furnishing information to refinance my primary residence. This is a great example of a "bait and switch." They came in much lower than a competing lender (local credit union), but when it came time to close, they found all kinds of additional or increased charges they 'missed' initially. They said, "trust me, we will do you right." I dropped the other lender 'trusting' them up until closing. What was quoted as a credit of $300 at closing suddenly became a 'cash needed at closing' of almost $3000. People, this is a scam. Don't fall for it. Stay away! I would not recommend this company, also known as Paramount to my worst enemy...seriously. I would go lower than one star if it would let me. "Trust me" (and you really can) you are wasting your time and energy for a terrible result. I canceled the entire transaction and found a local company. Write a Review for Loanpal!